AM, a very warm 75F. PM, T=81, stifling even though windy, with a cold front due. 7:55pm, Female out to the pecan, followed by the male (where was he today?). They hung out together then the male went off hunting around the back deck. C stood for a long time leaning against the Prius; saw the male with a dangley bit in his beak, but no one was at home in the box so he went off toward the burr oak on the street. 8:25pm, heard but missed Madame’s return, with the male trilling on her heels, bird in bill. Dang. Must have been a bird because she is really crunching bone. 9pm, female out and in again. More bone crunching and feeding. 9:55pm Male delivered a winged insect. At least one chick has put together the sound sequence signalling food (the thump of the male on the outer perch, his low trill, her alert clucking and reach for the hand off), so that it can be in front, mouth open. Their eyes aren’t even open yet. 6:25am, Female returned to the box (pic: Madame’s return), crunches up and feeds the chicks for a good 15 minutes then stashes what is left in the upper left corner. 6:55am, Female out for her last breath of fresh air. I went out, too, to watch from the driveway. Female hung out in the carport pecan, returning to the box at 7:05am. About the same time the male appeared on the Prius branch and after a few minutes hopped up into the big oak, the one leaning against the house outside the weaving room. Aha! Have we found his alternate day roost? It is near the end of a smallish branch and it is windy today, so it has lots of motion. I wonder if he will stay there when it starts to rain or if he will retreat to the window ledge roost. 7:15am, Wind has picked up and the misting rain is gone. Bird song is strong now—jays and mockers and grackles, but the intensity of the cardinal and wren really come through. 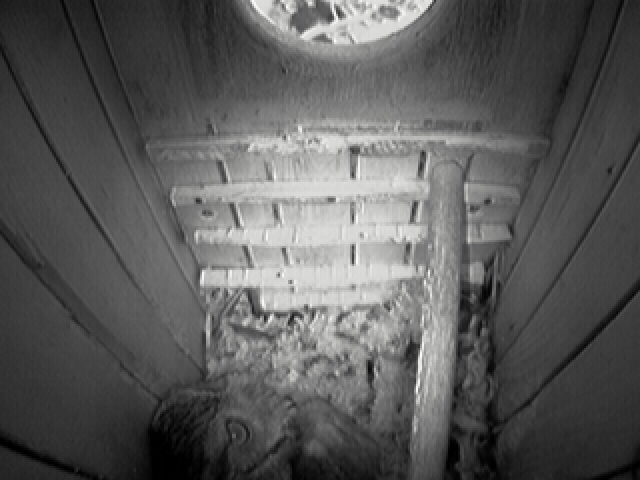 5:54am, female left the box briefly revealing all three hatchlings. The smallest one has a paler head, sandwiched between the two older siblings. 6:38am, Female into the entrance, then out. 6:55am, watching from the driveway outside. The male came from the front yard to the Prius branch, then up to the box entrance looking like he had something in his mouth. No one home. He returned to the Prius branch, then flew off around the front of the house. Just as he did the female came flying from the east, over St’s roof and back into her box. I barely stifled the impulse to call out to the male “Wait! She’s back!” How frustrating. 7am, I stayed still and continued to watch. The male returned to the driveway and caught a couple of insects in the computer oak and on the lawn. He is hunting late into the morning, and just for himself. 7:06am, He finally went to his roost, the cherry laurel today. It is already pale day out, full of bird song and squabbling. something tasty and tender to eat. Madam e goes on high alert. The squirrel pokes his nose in and POW! she strikes! Victory—squirrel vanquished! Madame Warrior Queen! 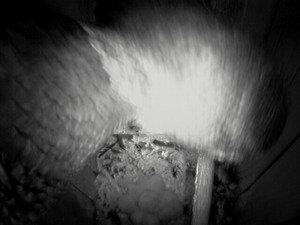 9:48pm Male delivers a big portion of bird to the nest box. Unbelievable feather litter ensues. Mid morning heard the distinctive crunching sound of mama owl eating another eggshell. Can’t really distinguish a third little cheeping voice, though. We will have to wait until she moves. Can’t locate the male today. He has a third mystery roost somewhere, undoubtedly within sight of the box. PM, warm at 7:45pm, robin scolding in the burr oak. I think she has a nest there, like last year. 7:57pm, male appeared in the backyard hackberry, apparently from the north side of the shop. He scanned the ground under the bird feeder, clearly in hunting mode (is this where he gets the occasional rat?). A minute later the female planed through the Gap to a low carport pecan perch. After hunting a bit more the male joined her, and though we couldn’t see her we heard the distinctive brief impatient chittering that is her usual response to the male’s attentions. T took the opportunity to slip inside to check the cam. No egg was visible. However, the chicks were piled together, unmoving, so could not verify for certain the advent of a third chick. 8:15-22pm she was giving the food-begging call. Male is sitting higher in the carport pecan, scanning the carport roof. 9:30pm, M delivered a golfball sized object. Bird? 9:50pm, M delivered another gobbet, not quite so large. Madame fed the enthusiastic chicks until, eventually, there was a lethargic silence from all the well fed occupants. 5:30am, Female was feeding on a bird carcass that arrived sometime during the night. Expect she had been feeding hatchlings earlier as they are quiet now. After feeding herself a bit, she moved the carcass into the back of the box and settled down quietly to brood. No chance so far to check the status of egg #3. Ahh—she shifted a bit and revealed egg #3 still intact. 6:45am, out of the box. Watching from outside we saw the F in the cherry laurel/crepe myrtle complex, joined by the male. He fed her something and they indulged in some soft antiphonal trilling. He went off to strop his beak on a nearby branch, then to his alternate day roost in the cherry laurel; she went to her box and babies. PM, T=75F at 6:30; a sunny, gorgeous day after a cloudy start. Madame has been feeding her chicks bites of the bird carcass from last night, first the chick under her right wing, then the chick under her left. Don’t think the 3rd egg has hatched yet. 7:58pm, robin scolding from St’s back yard. Female exits the box to the carport pecan in the back yard. Male flew to the nest box, then to the backyard, too. Not connecting with Madame, though. 8:03pm, the male on the pecan’s biggest arching branch has something big in his talons, tearing bites off of it. That was fast! 8:05pm he tries to deliver it to the nest box but the she isn’t there so he has to leave again. You can’t just drop it on the chicks, and it isn’t his job to feed them. 8:15pm, T, returning to the house, scared up an owl on the back porch. Was the female trying to bathe? 8:23pm, Madame returned to the box and settled. March 26, Saturday, first egg hatch, and the second! AM, T=52F, wind in the east and a bit of cloudiness moving in. Male is on his window ledge. We hear the F clucking a lot this morning. She is restless but not grooming or tearing something up. But she is poking at something below her and we think an egg has hatched! 3pm, yup, definitely cheeping coming from underneath her. She has moved everything back closer to the back edge of the box, partly out of range of the camera. Will take a snap whenever she shifts far enough off to see. 6pm, all that crunching we hear is the female eating the egg shell. She regains some calcium and cleans up the box at the same time. Lots of squeaking and peeping. If she would just move and let us see…. 7:30pm, the female finally hauled herself up to the entrance hole and revealed TWO hatchlings, not just one. The hatchlings are active, cheeping and occasionally flapping a tiny wing before lapsing back into exhausted sleep. 7:48pm, male, having walked along the fence for a while, flew east of the shop. 7:54pm, female left the box and nestlings (and remaining egg), through the Gap to the carport pecan. Male flew right in front of the garage to the backyard hackberry, then joined her in the pecan. 8:02pm, Madame returned to the box and on her heels was the male, trilling with his first food delivery: a bug bit, legs dangling. AM, T=48F. It is finally still after several windy days. Grackles are everywhere, full into their aggressive mating displays. Wish I could warm up to these birds. First sulfur butterfly of the season. PM, T=66F, after a cool and beautiful day. Male is not on the window ledge—we don’t know where he roosted today, but he may have shifted his roost to be closer to the nest box, preparing for hatching. Robins are scolding from the street and the cherry laurel. We have scanned everywhere with the field glasses but can’t find him. 7:55pm, female planes to the carport pecan, as usual. Don’t see the male. 8:02pm, she flew to a branch below but near the box. She caught something crunchy from the cherry laurel leaves, changed perches to eat it, then headed east into St’s yard. Female waited until the rain stopped to go out. Male is roosting, nice and dry, on the window ledge. PM, T=62; cool, strong winds through most of the day. 7:47pm, he is down on the fence and sits for a long time. 7:52pm he flew east of the shop. A sparrow squeaks from that direction—a coincidence? 7:58pm, female finally flew from the box, planing down through the Gap to the carport pecan. Male is in the small hackberry. 8:02pm the owls meet in the pecan and mate. We lost them after that. 8:05pm, she is back in the box. She is quiet all evening, getting only one small bug bit delivery by the male. AM T=68F, strong south wind even this early. Turned on the monitor and still didn’t see the female on the eggs. Perturbed now, I walked all over the property looking for feathers, down the street in both directions hoping not to see a squashed owl body, poked around under the box tree and driveway. Back inside I decided to take a picture of the 3 lone eggs, just in case. Hmm….couldn’t get the cursor to come up. Hmmm…. couldn’t get the computer to react at all. Aha! With luck this was not a missing female but a frozen computer. I rebooted and voila—there she was on her eggs. PM, T=70F. It has been windy all day, cloudy and now developing a periodic misting rain. So much for seeing the full moon tonight. The female has been pretty quiet. The cedar waxwings have not. 7:46pm, Female went to the pecan, then almost immediately back out to the driveway. All the action is in the driveway. Both owls made short flights into leaves and branches, mid to upper canopy instead of the ground. Windy and noisy, but not with insect sounds or geckos. 9:30pm, absolutely quiet—no feeding or hopping up into the entrance. No vocalizations or bug deliveries. Perhaps that pale, birdlike lump in the upper left corner is enough nourishment for tonight. AM, T=53F, ten degrees up from yesterday. Probably was a return to SE wind, though, to achieve this rise in temperature. There is a nearly full moon retiring to the western horizon. 10:06pm, ready to quit for the night but the F is not back yet. This is worrying.